Foxwell NT510 Multi-System Scanner is the most cost-effective professional scan tool of the industry. It is a unique tool that delivers genuine coverage, depth and value for different car manufacturers.Available applications are BMW, Mercedes, Fiat, PSA, Chrysler, Ford, GM, Honda, Nissan,Toyota and more. Foxwell NT510 is the most cost-effective professional scan tool for enthusiasts, small garages, independent repairs, specialized garages and technicians by delivering OE-level diagnosis on all the electronic systems. It does not only include basic functions such as codes and live data, but also is capable of advanced functions such as actuation, adaptation and programming. In addition, it lets you to access the most commonly required service features such as oil service light reset, throttle body adjustment, DPF regeneration and much more. Delicately developed by the most distinguished experts of this industry, NT510 Multi-System Scanner is the most cost-effective professional scan tool of the industry. It is a unique tool that delivers genuine coverage, depth and value for different car manufacturers. Foxwell NT510 will be shipped with one car software and OBDII package, and users are allowed to buy extra car software(each software cost 100usd) when necessary(up to five car software). Technicians will just have to pay for what they really need, which will greatly reduce their costs. Available brands are Chrysler,GM, Honda, Accura, Kia, Toyota,Lexus, Sicon, Land Rover, Jaguar, OPEL, Vauxhall, VW, AUDI, Seat, Skoda and more. 1. It is free update for 18 months,but you need pay 60 usd one year if you want to update after 18 months. Foxwell NT510 shows live vehicle sensors data in text and graph format and allows you to focus on any suspecious or symptom-specific data parameters. It's powerful graphing capability gives you the "real picture" of what's going on in the vehicle. You can view 2 parameter graphs simultaneously and merge them into one coordinate. So you can easily see how they affect each other, providing you with the most comprehensive and functional look at live data possible. Foxwell NT510 diagnostic tool cannot only read your codes, but it can also actuate components, run system tests, program control modules. Reading the trouble codes from your vehicle is easy, but without live data, bi-directional controls and other special functions, you may not have enough information to get the problem fixed right. It allows you to use the scan tool temporarily activate or control a system or component. With NT510, the check of electronic components such as switches, sensors, relay and actuators is made a simple task, saving your time and labor costs. It gives you the ability to flash a control unit with ne program data. Provided that a module can be re-coded, NT510 allows for the coding and programming of a replacement control module or changing previously stored incorrect coding as expensive factory tools do. With internet access,you will always have the latest bug fixes,new vehicles,newly added parameters and functionality at your fingertips.And they are free for the first 18 months after your registration.Simply install the SD card into your computer or an SD card reader,log into PC application,and click update.The application does all the work,syncing the latest software to your tool. The easy yet elegant design of this scanner was developed by technicians for technicians.Clearly arranged keypad,menu-driven operation,shortcuts and impressive 2.88'' color display together make the scanner extremely easy to use. NT510 is built to last.It is constructed to resist impact:and damage in the tough workshop environment.A rubberized sleeve protects your investment.The secure fit,extra corner padding and screen protector ensure your scan tool will be around for a log time. 1. There are two ways to download the update PC application. a. Visit our site www.foxwelltech.com and go the Product page. Find your product model and click it to view the product profile. Select Download tab to download the PC application file. b. Log in at www.foxwelltech.com , go to your Member Center and select Registered Product. Click Software Details. You will find the link right on the top of the softwares. 2. Unzip the application file. Follow instructions on computer screen to install the application and driver. 3. Double click the desktop icon to launch the application. 4. Remove the TF card from the scanner, put it into the card reader and plug the reader into the computer. The TF card is on the left side of scanner. 5. Log in with your Foxwell ID and password. 6. Foxscanner will automatically recognize the serial number and display all available applications, please read it carefully before update. Please note that you are allowed to select and install any one of the vehicle software from the available update list free of charge and in future you are allowed to install updates of the selected brand only. In case you want to install any other vehicle software, please contact us or sign in your member center to place an order of buying extra software. 7. Click the check box(es) in front of the software you wish to update and then click the Update button to download. 8. When Update button is clicked, it begins to download. And you can check the Current Status. If the Current Status shows Downloading, please do not close the update application. Please do not close Foxscanner until it shows Update Done. 9. Please click Software Management to review all the updated software. 10. To uninstall some software, please select them and click the Uninstall button. More detail information about Foxwell NT510 Update,pls read Foxwell NT510 updata guide manual at the "Related Download Files"
The easy yet elegant design of this scanner was developed by technicians for technicians.Clearly arranged keypad,menu-driven operation,shortcuts and impressive 2.8" color display together make the scanner extremely easy to use. Foxwelll NT510 is built to last. It is constructed to resist impact and damage in the tough workshop environment.A rubberized sleeve protects your investment.The secure fit,extra corner padding and screen protector ensure your scan tool will be around for a long time. Now, i have read and cleared error codes on the air bag, central locking and reset air bag and service interval lights. Very easy to use it; i mean, follow the screen instruction, and all will be done! Here i did an easy screenshot for anyone in need. I have to say it’s worth every penny. Faster shipping would be better you know. 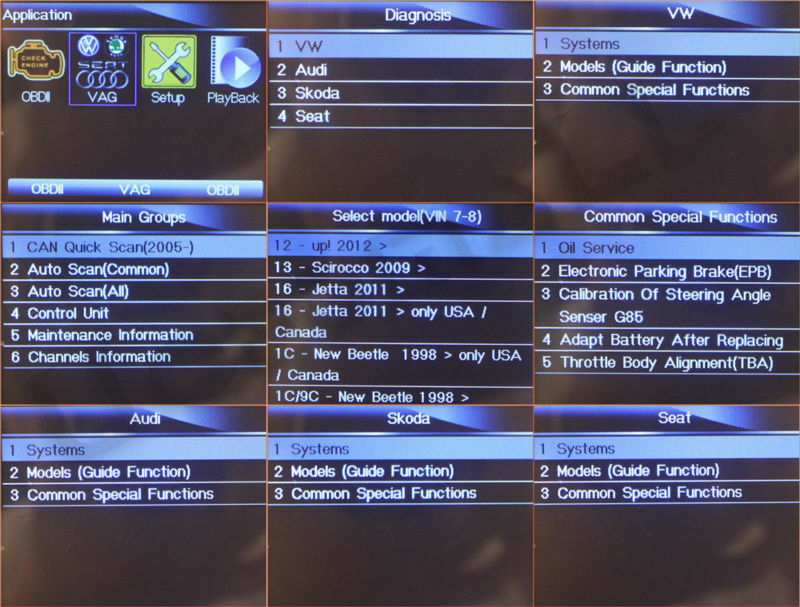 NT510 scanner CAN be used for a 1997/98 Vw passat estate tdi to to find faults on the air bag system, central locking and reset air bag and service interval lights. It will read the TMPS sensors and show if they are active but they do not relearn the location of the sensor to the vehicle. Also as far as a key FOB all it does is check the signal strength of the key FOB, does nothing for the RE-programming aspect. CAN be used for bleeding the brakes & for actuation of the ABS pump, and also used to code a new battery. kelvin pinney on: This thing is freakin' awesome on the VW/Audi cars! The number of things it can check and adjust is pretty amazing. It's easy to use, and you really don't need an instruction manual. I frankly expected less, but waspleasantly surprised by a very comprehensive menu. job done in no time. Added bonus that it can read all the VW codes. the extra features it can access in the VAG system. This is a MUST buy for anyone who owns a VW or Audi! controlling service interval resets and manually triggering many components (individual lights,windows, brake caliper opening). This reads the BMW codes which are way beyond standard OBD-II codes. Joe:Foxwell NT510: It worked great on my 2006 Honda Civic EX 1.8L, Manual Trans. Ping:Foxwell NT510 can reset throttle and transmission adaptations on BMW E90. Here are a few opinions/comments to the Foxwell NT510. 2. I have verified all of the listed things on actual vehicles.Have access to many makes and models. 3. Foxwell has been adding features quickly to this tool, many updates with added features, so it does seem to supported reasonably well. models, I also find that you sometimes need multiple tools to compare error codes and some provide more data than others. 5. The problem with some of the more advanced features is you may need to actually "code" or "program" modules in some way, so I have limited my use to only doing the things that needed to be done on vehicles I have run across. It sounds like the OP may work in a shop where they see MANY cars on a daily or weekly basis.